Flight prices are generally a bit higher in cities where there's Super 14 rugby matches going on (so even if you're not interested in rugby it's good to be aware of when the matches are). Here's the fixture list for the final year of Super 14 rugby (next year is Super 15, with the Melbourne Rebels being the new team). The Cheetahs and Lions have everything to play for, with there being a good chance one will be replaced by the Southern Kings in 2011. Who do you think is going to win the Super 14? I will be back from our cruise on the MSC Sinfonia, just in time to watch the Super 14's opening matches. As a die-hard Stormers fan I'm hoping that they wont flatter to deceive this year. We know that Interlink has had some difficulties since their plane got damaged when it flew into a bird, but they are still offering the cheapest flight prices from Gauteng to Durban. There's only R4 difference in flight prices of 1time and Mango from Johannesburg, so it really comes down to which airline you prefer. * one-way flights from Johannesburg to Durban, leaving Johannesburg between 1729 & 2036 on Friday the 12th Feb 2010. Prices will change. 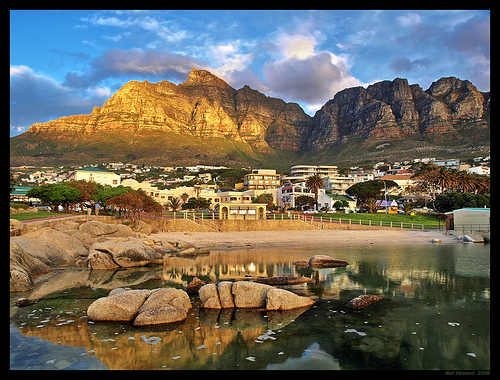 These photography bloggers published the most awesome pictures of Cape Town.